Important news for webmasters: Google has just announced that, starting April 21st, they will increase the importance of mobile-friendliness as a ranking factor in mobile search results. Considering that more than 25% of searches are now from mobile devices (and even higher with local searches), this is going to have a drastic effect on search results. It will probably be one of the biggest search engine changes we’ve seen in the past few years. We expect that websites which are not optimized for mobile users will be largely removed from the SERPs when users search on a mobile device. If your website is not optimized for mobile phones by the end of April, you can expect to lose your traffic from mobile devices to competitors who have optimized for mobile. How do you know if your website is optimized for mobile? 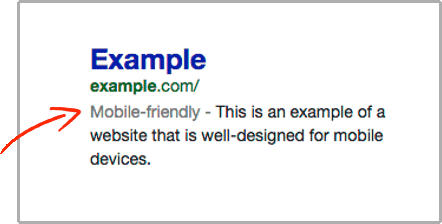 Remember, Google already highlights mobile-friendly websites in search results from mobile devices. Whether or not your website is currently listed as mobile-friendly is a good indication of whether this algorithm update will help or harm your rankings. Even if you are already listed as mobile-friendly, it is still important to check your website (including front pages and subpages!) for mobile-friendliness. How does Google decide if a website is mobile-friendly? Google mainly looks at whether a website is responsive, i.e. whether the content will adapt to screen size so the visitor doesn’t have to annoyingly scroll horizontally or zoom in to see content. It is also important that all texts are easy to read on small screens and buttons and links are user-friendly sizes. Aside from harming search rankings, not having a mobile-friendly site is bad for user experience and thus bad for conversions. So take some time to visit your website from mobile devices, browse around, and see if you can’t streamline the design and processes so it is easier for mobile users. If you aren’t sure where to start, check out the Google Guide to Mobile Friendly Sites.